Okay, I lied. He doesn't quite come to grips with them. More like 'terrified to death' by what his eyes are capable of doing. In this case, that's destroying school property and causing a bully to soil his pants. Wonder how long it'll take him to locate a pair of super-strength Ray-Bans? 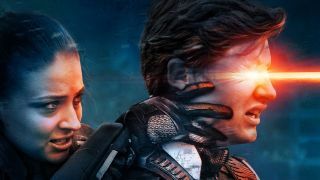 Directed by Bryan Singer and starring James McAvoy, Michael Fassbender, Oscar Isaac, Jennifer Lawrence, Olivia Munn, Tye Sheridan, Alexandra Shipp, Sophie Turner, Rose Byrne, Nicholas Hoult, and Hugh Jackman, X-Men: Apocalypse will now be released in UK cinemas on May 18, 2016 before making its way to US theatres on May 27, 2016.